First time this year! It was lovely! Okay, okay this picture was actually taken a couple of summers ago, but soon my yard will be looking like this again. I even got the perennial beds cleaned up, so I earned that beer too. I wasn't in any hurry to get rid of last year's growth because you know we'll get a couple more snows this spring and I don't want to chase the ladybugs out of their nests just yet. But hell, it's time they got going already. I'll keep the dead stuff in an open bin in the garage for a couple of weeks before composting just in case there are any ladybugs still sleeping in there. 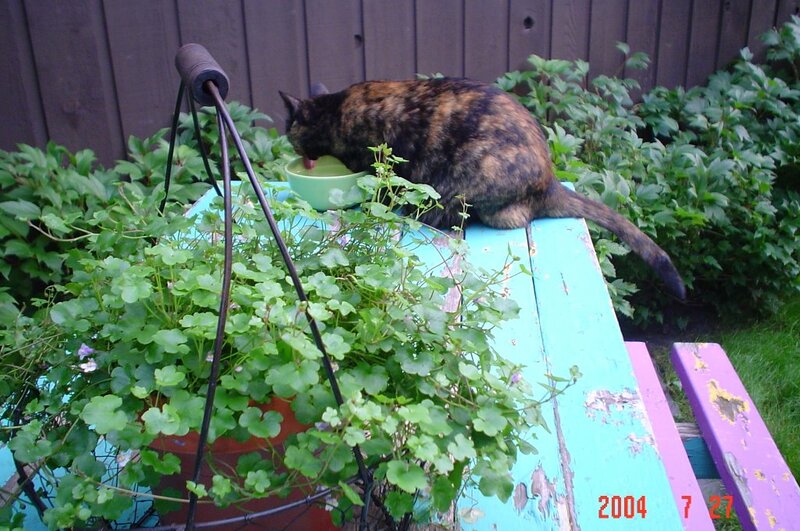 I'm not as interested in gardening as I once was. I still like to have lots of greenery around but I just don't want the work anymore. Fortunately my garden is mature enough that I now have minimal work to do for maximum returns. I can't believe how much things are growing already. 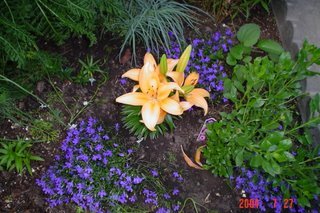 The anemones and the rockcress are already blooming, and the daylillies are about to. And with all the dead crap gone, everything looks so fresh and lush, and makes me long for those evenings when we eat supper outside and huck our corn cobs on the lawn and then lounge over another glass of wine, and maybe later have a fire in the pit. When are you guys going to come join us for a barbeque? I don't know anything about flowers or gardens, but I do know the parents are going to try growing watermelons in the yard this summer. I say good luck, there'll be winter snow on the ground again before the seeds can even take root, I'm sure. It is Winterpeg after all, but they're enthused. Good luck with your yard though, the bonfires and corncob chucking sounds awesome! Whoa, watermelons? Your parents are adventurous, Alana. I grew up in Winnipeg and my parents grew all kinds of weird stuff, but I don't think they ever tried watermelon. I love eating supper outside, in the brief time when it's not too chilly and before the wasps start to forage, because my family are sloppy eaters. Yeah, Maureen, I cheated with the pics. I wait until June before planting anything here. The nights still get so cold up until then. Put those kids to work! oooh, pretty! I LURVE your distressed colored picnic table/bench. 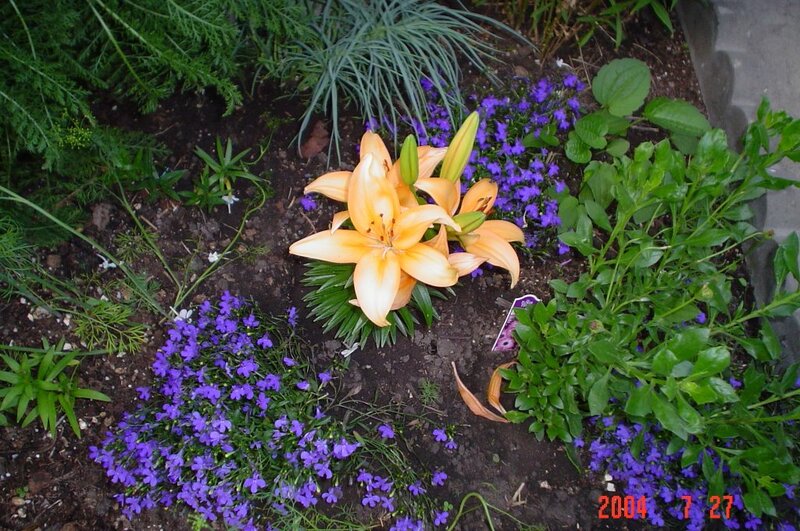 I also adore that orange lily swaying above a bed of my favorites - lobelia. Enchanting combination. Seriously, next time I'm in your neck of the woods, I'll take you up on that barbecue! Phlegmfatale, I'm going to hold you to that - you had better come for a big old AAA Alberta steak next time you are up this way. My husband would be thrilled to try out his steak-grilling skills on a Texan. There will be no more snow. no more snow. no more snow. If you say it enough it's true! Kelly, I LOVE evening scented stock! I plant it every year, too, usually under some windows or along a walkway. And you do not sound like a wuss; you sound like a guy who is confident enough in his masculinity to appreciate a spot of gardening after a hard day of mountain climbing and cougar wrassling. Your Japanese maple sounds lovely too. Thanks for keeping me up to date on links, you blogger stalker, you. kidding! It's a grand way to find people with similar interests. Mmm, good old Alberta barbeque. Ruhee, you'll miss that I know, but I hear Toronto has some pretty good stuff too. When we're in your hood, we'll stop by for some BBQ. I'm going to hold you to that, Will. We'll stuff you guys with bbq if you are by this way, so bring stretchy pants. what is it with men and grilling? I think since they don't get to physically kill dinner and drag it back to the cave these days, it's the nearest they come to owning their inner chest-thumping neanderthal. Oh well mine fly fishes too, Phlegmfatale, so he is very very manly (snort). Well he generally practises catch and release, but he still gets to dominate something.